Still in Camera+, click Edit » Scenes » Beach. Save it to the Camera Roll. Open the photo in Percolator. Under Grind, choose Extra Fine, tap the small arrow next to it, and choose Smallest under Circles and High Contrast under Effect. Click the blue Re-Grind button. Under Brew, choose Treble, tap the small arrow next to it, and choose ¾ under Pic and Darkest under Blend. Click the small arrow next to Treble again to close the options. Under Serve, choose Black, tap the small arrow next to it, and choose Rise-n-Shine under Tone and Smooth under Texture. Click the small arrow next to Black again to close the options. Click the heart icon and "Save Image to Photos". Open the photo in PictureShow, click the center of the top menu, and choose LomoGraphy. Save the photo to the Camera Roll. This is my kitty Onion sleeping in the sun, having the nap I wish I was having. 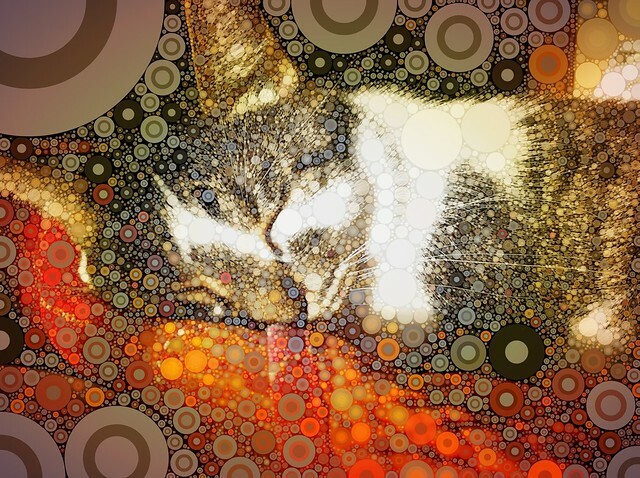 And, yes, I realize that the second photo is perfectly fine as is, but Percolator's too much fun not to play with, don't you think?